Yu Suzuki, Ryo Hazuki, and Shenmue fans have traveled a long and difficult road together. Shenmue is a popular topic of dialogue again thanks to the recent release of the Shenmue 1 and 2 remaster, and the sadder news about Shenmue 3 not arriving for another year. It's been 15 years since Shenmue 2 hit the Dreamcast (and the Xbox, if you live in North America), but even though the conversation around Yu Suzuki's revolutionary open-world game dimmed over the years, it never died. What makes Shenmue so special that its name endured time's erosion for over a decade? As we outline here, Shenmue is constructed on unique ideas that revolutionized adventure games. Its influence is undeniable, even though the series was forced into hibernation a mere few years into the new millennium. The Shenmue games are the opus of game developer, designer, and programmer Yu Suzuki. Suzuki worked at Sega from 1983 through 2011, where his name was gradually attached to one pivotal arcade game after another. Hang-On, Out Run, Space Harrier, Virtua Racing, Daytona USA, Virtua Fighter, and many more classics carry Suzuki's fingerprints. With the advent of the Sega Saturn, Suzuki hoped to make a game that didn't revolve around the time limits that typically prevent arcade-goers from relaxing and truly immersing themselves in an experience. He researched RPGs and built a simple prototype RPG for his own for the Saturn called The Old Man and the Peach Tree. When the demo turned out satisfactory, he began developing an RPG based around the Virtua Fighter series. Suzuki's Virtua Fighter RPG starred Akira, one of the characters from the series (he's the "face" of the games in the same way Ryu is the face of Street Fighter). Even this early molting of Shenmue was ambitious: Suzuki employed script writers and movie directors to help him with the RPG's eleven-chapter narrative. Suzuki also wanted open 3D environments, hours of cinema scenes, lots of voice acting, and a battle system based around the Virtua Fighter engine. The Virtua Fighter RPG's story followed Ryu as he travelled to China to encounter a mysterious assailant who murdered his father. That should be a familiar tale for anyone who's a fan of Shenmue and Shenmue 2. The Saturn's popularity faded prematurely, and Sega funneled its energy into launching its successor, the Dreamcast. 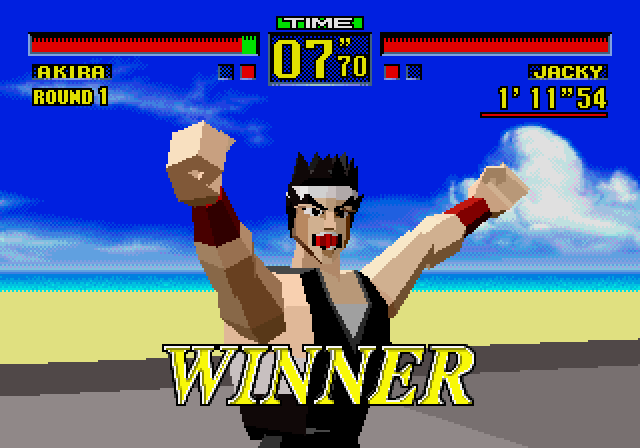 The Virtua Fighter RPG's development hopped onto the Dreamcast, where its ties to the fighting game series were gradually snipped. Sega hoped Suzuki's project would become a killer app for the Dreamcast, and it made sense to give the RPG a new name and a fresh face. 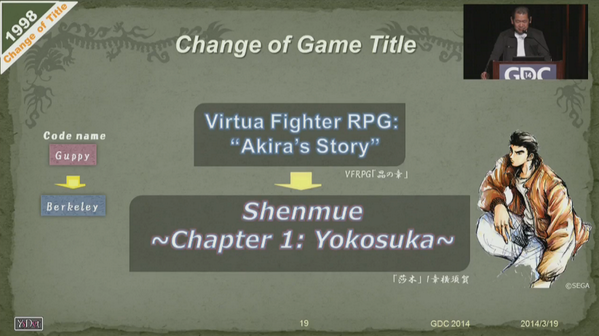 Virtua Fighter RPG: Akira's Story changed its name to Shenmue: Chapter 1: Yokosuka, and Akira was re-cast as a young martial arts pupil named Ryo Hazuki. Suzuki's plans for Shenmue kept on growing with the switch to the Dreamcast. He applied three key words to Shenmue's development: "leisurely," "fully" and "gently." Above everything else, he wanted players to explore an open world at their own pace. 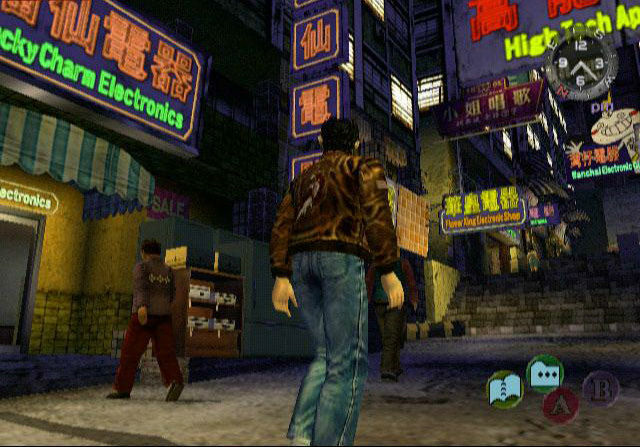 Sure enough, Shenmue's environments boast a level of detail unseen in games until its release in 1999. NPCs adhere to set daily schedules, nearly everything in-game can be touched and examined, and the game's depiction of 1986 Yokosuka, Japan is littered with dozens of mini-games and activities. Quick-time events (which Shenmue popularized in modern games—for better or worse) help orchestrate the action and move the story forward. Over 300 people were involved with Shenmue's development by the end of the project, and Suzuki's team had to invent new compression algorithms to prevent the game from ballooning to 50 or 60 game discs. Ambition comes with a price tag, however. Shenmue's reported budget of $70 million USD was astronomical for its time (though that price tag includes some of the work that went into developing Shenmue 2), and Sega had trouble recouping it. Suzuki initially intended for his Virtua Fighter RPG to be a multi-chapter epic, and he has similar plans for Shenmue. Ryo's quest for justice against his father's killer continues with Shenmue 2, which contains the depth and scope of its predecessor—and then some. In addition to goofing around in the game's open world (which is situated in 1987 Hong Kong) and enjoying mini-games and arcade machines, players can earn money for their journey via a multitude of means. Some of these include arm wrestling, gambling, street fighting, and running a pachinko stand. Unfortunately, Shenmue 2 arrived in fall of 2001—a rough time for Sega. The Dreamcast was discontinued in March of 2001, and Sega was beginning its exit from console development. Shenmue 2 came to the Dreamcast in Japan and Europe, but it wouldn't arrive in North America until an October 2002 release on the Xbox. Shenmue and Shenmue 2 sold well, and the second installment of the series solidified its fanbase. Unfortunately, it didn't sell well enough to let Sega recoup its costly development. Shenmue 3, though planned, sank into development hell for better than a decade. When Suzuki transferred development of Virtua Fighter RPG to the Dreamcast and re-branded it with the Shenmue name, Sega hoped the game would become a "killer app" for its follow-up to the failed Saturn. That's probably why it was unafraid (well, publicly unafraid) to invest so much money into Suzuki's project. In an alternate world where the Dreamcast was a PlayStation 2-level success, Shenmue might've been the system's enduring must-buy—maybe in the same way Super Mario 64 and The Legend of Zelda: Ocarina of Time became the two games every N64 owner needed to have. Alas, long-term success wasn't part of Shenmue's story. 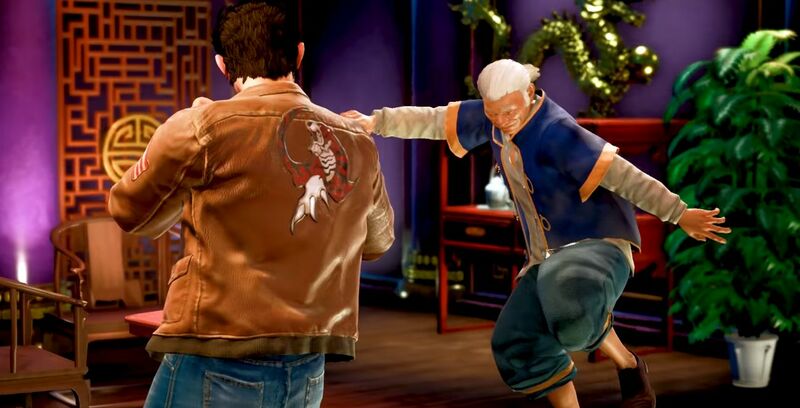 The series sank into torpor until Yu Suzuki (long since gone from Sega) successfully Kickstarted Shenmue 3 in 2015 for the PlayStation 4 and PC. Ryo lives again. Now we just have to wait for the final product. And wait. Good thing Shenmue fans are a hopeful and dedicated bunch. There are detractors who suggest Sega surpassed the Shenmue series ages ago with Yakuza, but Shenmue's enduring fanbase just wants to see the series rise again, like the winged figure adorning the Phoenix Mirror. Will Shenmue's story continue to be told after Shenmue 3? One thing at a time, I suppose. Let's just start warming up for our big fight in 2019. Tagged with Analyses,	Sega,	Shenmue I & II,	Ys Net,	Yu Suzuki.